indiscriminate weapons that pose unacceptable dangers to civilians. The December 17, 2009 attack on al-Majalah had targeted members of Al-Qaeda in the Arabian Pensinsula (AQAP) and had killed 14 allegedly armed militants but also 41 Bedouin civilians sleeping in tents nearby. 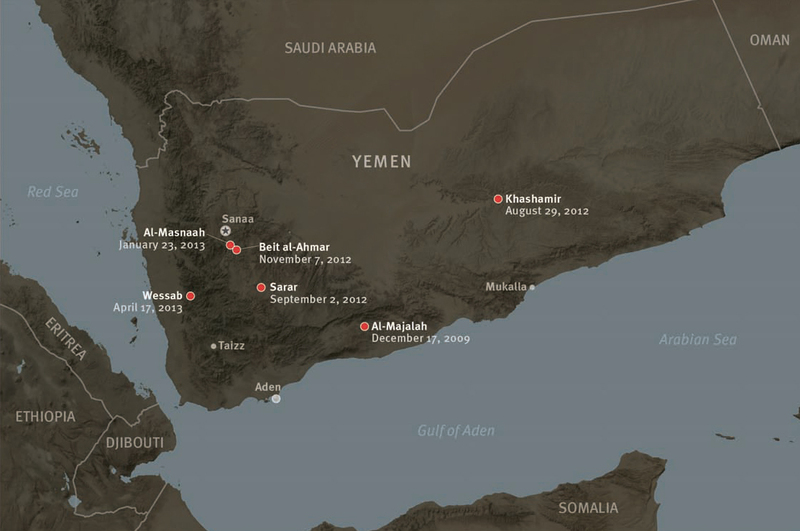 HRW has documented targeted killings by U.S. strikes in Yemen (see map) in an October 22, 2013 report which can be found here [pdf]. “The US Joint Special Operations Command (JSOC), which is a semi-covert arm of the military, and the Central Intelligence Agency (CIA) are estimated by research groups to have carried out 81 targeted killing operations in Yemen: one in 2002 and the rest since 2009. The strikes by drones, warplanes or cruise missiles by various counts have killed at least 473 combatants and civilians. The United States has also carried out hundreds of targeted killing operations, primarily by drones, in Pakistan and a small number of such strikes in Somalia. What makes Obama’s 2009 strike special is the fact that it had been confirmed in a diplomatic cable which had been leaked by WikiLeaks in 2010. The classified cable (“NOFORN”, i.e. not for release for foreign nationals) can be found here. The wording is, as usual, revealing. It once again indicates the close collaboration with dictators and the obvious habit of misleading the public. ¶1. (S/NF) SUMMARY. The ROYG views the December 17 CT operations as a success and a benefit to Yemeni national interests, and appears not overly concerned about unauthorized leaks regarding the U.S. role and negative media attention to civilian deaths. ROYG officials continue to publicly maintain that the operation was conducted entirely by its forces, acknowledging U.S. support strictly in terms of intelligence sharing. Deputy Prime Minister Rashad al-Alimi told the Ambassador on December 20 that any evidence of greater U.S. involvement ) [sic] such as fragments of U.S. munitions found at the sites – could be explained away as equipment purchased from the U.S. While the ROYG has touted the operation as a victory in terms of the number of al-Qaida in the Arabian Peninsula (AQAP) members killed or captured, it hasn’t yet decided how, or even if, it should begin to modify its public messaging to address criticism over collateral damage, or the likelihood that the extent of U.S. involvement may become impossible to deny. END SUMMARY. ¶3. (S/NF) Alimi told the Ambassador that Saleh was undisturbed by press reports citing U.S. officials asserting American involvement in the operations, saying that the ROYG ‘must maintain the status quo’ with regard to the official denial of U.S. involvement in order to ensure additional ‘positive operations’ against AQAP. Alimi seemed more concerned with the political opposition and Southern Movement’s use of the Abyan operation as an example of the government’s heavy-handed response to groups the ROYG deems a threat. The Ambassador cautioned Alimi that the ROYG may need to nuance its position regarding U.S. involvement in the event more evidence surfaces, complicating its ability to adhere to the official line that ROYG forces conducted the operations independently. Alimi appeared confident that any evidence of greater U.S. involvement ) [sic] such as U.S. munitions found at the sites – could be explained away as equipment purchased from the U.S. However, Alimi informed the Ambassador that senior ROYG officials continue to the discuss media strategy and the public posture of the ROYG. ¶4. (S/NF) According to Alimi, the ROYG has recruited a number of local political and religious leaders to visit the are[a]s affected by the air strikes in Abyan to explain [t]o the people the need for the operation and the d[a]nger that AQAP poses to all Yemenis. The Govern[o]r of Abyan was given YR 20 million (approximatel[y] USD 100,000) to disburse to the families of those killed or wounded in the strikes in Maajala, where the AQAP training camp was located. Alimi said that the civilians who died were largely nomadic, Bedouin families who lived in tents near the AQAP training camp and were assisting AQAP with logistical support. Alimi said they were poor people selling food and supplies to the terrorists, but were nonetheless acting in collusion with the terrorists and benefitting financially from AQAP’s presence in the area. He assured the Ambassador that the Governor of Abyan visited the site after the operation and confirmed that there were no villages, houses, or civilian institutions that were damaged, only the training camp, and the encampments of the non-combatant Bedouin population. 18 December 2013 @ 3:21 pm. Last modified December 18, 2013. This entry was posted in Yemen and tagged Al-Majalah, AQAP, CableGate, collateral damage, Human Rights Watch, WikiLeaks. Bookmark the permalink.